A magnificently engraved and historic plan of London. 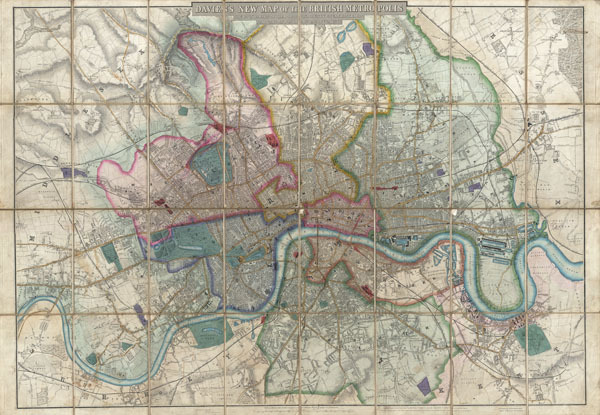 Davies's New Map of the British Metropolis, The Boundaries of the Boroughs, County Court Districts, Railways, and Modern Improvements. A rare, extraordinary, and beautifully engraved 1852 case map or pocket plan of London, England, by B. R. Davies. Covers the center of London from Chiswick east to Bugsby's Reach and the Victoria Docks, extends north as far as Stamford Hill, and south as far as Nunhead Cemetery. Davies first issued this map in 1848 and updated it regularly well into the 1870s. In the period between 1830 and 1865 London experienced an extraordinary period of expansion and growth as new railroads increasingly brought suburban communities into the urban fold. Davies's annually updated maps are considered an important chronicle of this change. This map is beautifully engraved, with streets, blocks, important buildings, parks, topographical features, waterways and railroads clearly noted. Features beautiful original hand color. Dissected and mounted on linen in 32 panels, folds into original slipcase. Published for Benjamin Rees Davies of 6 George Street, Euston Square, by Saunders and Stanford, of 6 Charing Cross, London. While later examples of this map, from the 1870s, do occasionally appear, the earlier editions, predating 1860, are exceedingly rare. This is the earliest example of this map to appear on the market in over 30 years. Benjamin Rees Davies (1789 - December 16, 1872) was an engraver, cartographer, painter, and map publisher active in the early to mid-19th century. Davies was born in Holborn, England, apprenticed as under John Lodge in 1803. He began publishing around 1811 and is known to have compiled many of own maps from original survey work. From approximately 1848 onward Davies published in conjunction with the Stanford Firm. He is also known to have engraved a number of maps for the Dispatch Atlas and the S.D.U.K. Davies was an early adopter of steel plate engraving and used the exceptional hardness of steel to create some of the most delicately engraved and beautifully produced maps of his era. He was quite famous in England for his detailed street plans of London, which he began publishing in 1848. Davies is known to have worked with numerous other cartographers of his period including French, Mexican, and American map makers. Many of his maps and plans continued to be published and updated posthumously well into the 1880s. Very good condition. Original linen backing. Minor edgewear at fold intersections. Minor pen marking along Blackfriar's street. Comes with original linen slipcase. Hyde, Ralph, Printed Maps of Victorian England, 1851-1900, no. 27.